Paul Winkhaus was the promoter in Greenville and Asheville and surrounding areas for Jim Crockett Sr. in the 1950s and 1960s. WLOS was the home of "Wide World Wrestling" and later "World Wide Wrestling" in the Asheville Greenville Spartanburg market. For some period of time in the 1960s and early 1970s (it's unclear for exactly how long), the wrestling show taped in High Point, NC at the studios of WGHP aired on WLOS television in Asheville. Championship Wrestling was one of two Crockett Promotions shows that aired in the market, along with All-Star Wrestling/Mid-Atlantic Championship Wrestling which was taped at WRAL in Raleigh. When WGHP host Charlie Harville would break away to do local spots for his home market of Greensboro/Winston-Salem/High Point, WLOS would break away simultaneously and air their own local spots for the upcoming shows at the Asheville City Auditorium. These spots were taped at the studios of WLOS-TV. The host for these segments was Munsey Millaway, who was the sports director at WLOS in the late 1960s and early 1970s. He sat at a desk with a wall behind him which was full of 8x10 black and white photographs of various wrestlers taken by Gene Gordon. Millaway would often be joined by Paul Winkhaus, the local promoter for Jim Crockett, Sr. He and Millaway would announce and discuss the upcoming matches for Asheville. Millaway also attended the matches on Wednesday nights at the Asheville City Auditorium and would occasionally take a WLOS cameraman with him to record some of the matches, highlights of which he would show on the 11:00 news that night. Millaway told us in an interview for this feature that Mr. Winkhaus also would occasionally bring wrestlers by the studio to tape interviews that would be shown both during the Championship Wrestling cutaways and on the evening sportscast. "Sailor Art Thomas, Johnny Weaver, George Becker and many others were brought to the station for interviews," Millaway recalled. "These segments were extremely popular on the newscasts. I don't think (station manager) Mort Cohn realized how popular it would be. It got better ratings than any other sports on the station." WLOS Sports Director Munsey Millaway in a publicity/promotional photograph from the late 1960s. Millaway, now making his home in Boone NC, looks back fondly on his days working with promoter Paul Winkhaus promoting wrestling on WLOS. "Those were just wonderful times, and I loved Mr. Winkhaus, my wife and I both did. There was no finer gentleman than this man. A class act. He treated me wonderfully and treated fans the same way." 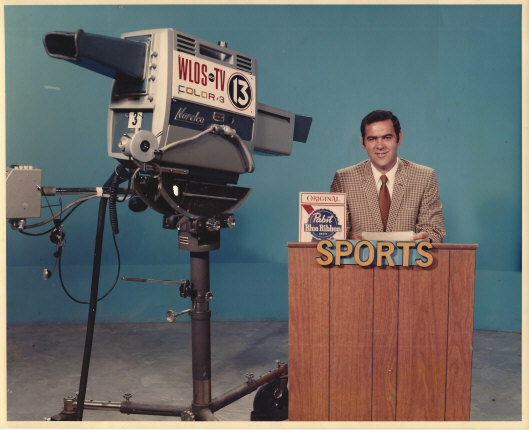 When Millaway left WLOS in the early 1970s, the sports director who replaced him was not as enthusiastic about wrestling, and despite the ratings success of the produced segments for the news, emphasis on wrestling at the station waned. In the summer of 1974, the WGHP show was replaced by the 2nd taping of Mid-Atlantic Wrestling in Raleigh (for more info, visit the WRAL page) which was hosted by Les Thatcher. While it isn't clear when WLOS ceased doing their locally produced promotional spots for WLOS, they certainly ended at this point if they had not already. Thatcher did the voice over promotional spots for Asheville and studio promos with the wrestlers were taped at WRAL in Raleigh as well. *Note: When Munsey discusses wrestling on WLOS in this audio clip, he is referring to the station's coverage of professional wrestling during its newscasts, and not necessarily the wrestling program that aired on Saturdays. Special thanks to Don Holbrook for his assistance with this feature. Special thanks to Munsey Millaway for the providing the photo from WLOS TV. WLOS channel 13 is the ABC television affiliate in Asheville, North Carolina. It also serves other portions of western North Carolina, upstate South Carolina, northeastern Georgia and far-eastern Tennessee, including Greenville, Spartanburg and Anderson. The station is owned by the Sinclair Broadcast Group and its sister station to WBSC-TV, the market's WB affiliate. WLOS' transmitter is located atop Mount Pisgah. The station signed on air on September 18, 1954. However, its signal didn't reach the entire market. The South Carolina portion of the market was served by WAIM-TV, channel 40 in Anderson. WLOS boosted its signal in to cover the South Carolina portion in 1979, and pressured ABC to drop its affiliation with WAIM. The station was owned by Anchor Media; it was then owned by Wometco until 1984, when the company was sold to the investment firm Kohlberg Kravis Roberts & Co. (KKR). WLOS was later sold to River City Broadcasting, which merged with Sinclair in 1996. Ironically, channel 40 in Anderson, now WB affiliate WBSC-TV, is now operated and effectively owned by Sinclair.